It is one special day, planned for months or even years, and the memories of it will last a lifetime. Your children, grandchildren and their children may pop in the DVD and relive every aspect of the wedding, the speeches and the dancing. No pressure then. Fathers, Grooms, Best Men, and any other speakers, your speech is one of the most important you will ever give. You want it to impress, to be from the heart and you want it to be remembered. That in a nutshell is what we do. We will help you prepare, edit, practise and deliver a speech that both you and everyone will be proud of. Look around this site for some further details. You won’t find sample speeches, ideas to steal, borrow or adapt. If you think a re-hashed secondhand speech is appropriate then you are not looking at the right site. Your daughter, bride, groom and attendants are worth more than an off the shelf tired generic speech. Remember, it is your wedding. Let it be whatever you want it to be. Traditionally speeches begin with the Father of the Bride who ends toasting the Bride and Groom. The Groom replies to that toast and ends toasting the bridesmaids and attendants. Finally the Best Man replies on behalf of the bridesmaids and concludes the speeches setting the mood for the festivities that follow. However, mothers, friends, brides and other important people can all give a speech if you want. Maybe not all of them at the same wedding but remember: YOU decide because it is your wedding. Our role is simply to remove the stress from the speakers, to help them find their words to express what they want to say, and coach them to deliver those words. Let us help you to have a day that you are proud to remember. 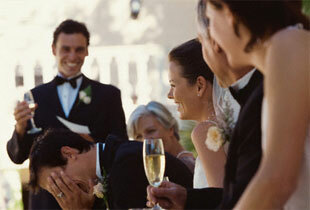 Work together with the Groom, Best Man and Father of the Bride to create 3 truly memorable speeches. "People complimented me, saying how natural they thought the delivery was. Several close friends were amazed."